The Water Cooled VRV (VRV-WII) offers an alternative to traditional centralized equipment. It is available in three outdoor cabinet sizes of 5, 6 and 7 tons and using a modular approach to serve a single system up to 21 tons in seven different capacity combinations. Weighing 330 pounds and measuring less than 40-inches high, the system is designed to fit taller and larger applications operating with closed loop cooling tower, or dry cooler and boiler operations. 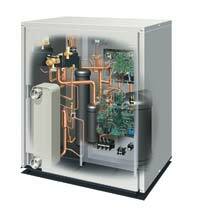 It allows for extensive refrigerant piping, enabling several spaces to be cooled by a single refrigerant circuit. It uses the same Daikin inverter technology that is used with air-cooled systems, but extends the application of VRV products by using the same VRV indoor units and controls options.